It’s Condiment Week on Panini Happy! There’s nothing like bright, flavorful condiments to kick up panini, so I thought I’d step away from the grill this week and focus on these often unsung treats. I’ll be making three different ones this week – first up is Roasted Garlic & Onion Jam. It’s no secret that I’m a huge fan of caramelized onions – I’ve used them again and again in past panini. Onion jam takes the concept to the next level – a bit more sugar, balsamic vinegar for a little acidity, and even longer cooking time. It’s worth it, believe me. I never knew onions could be this (pleasingly) sweet. This particular recipe incorporates roasted garlic, which makes it even better! You could easily substitute this jam in any panini recipe calling for caramelized onions (such as the Gruyere with Caramelized Onions Panini or French Dip Panini) – it’ll add unbelievable sweet and savory flavor. I tried it on a simple turkey and Swiss sandwich just today for lunch and it was divine. Squeeze roasted garlic cloves unto a small plate. Set aside. Cut onions in half lengthwise; peel. Cut off ends; cut lengthwise into 1/4-inch thick pieces. Coat a 13″ skillet with cooking spray, and set over medium heat. Add onions, and cover. Cook, stirring occasionally, until softened and translucent, about 15 minutes. Add sugars; re-cover. Cook, stirring occasionally, until onions are golden, 20 – 30 minutes. Add 1/4 cup water and stir. Cover and cook until dark brown, 20 -30 minutes. Add balsamic vinegar, roasted garlic cloves, and another 1/4 cup water. Continue cooking until liquid has been absorbed, about 10 minutes. Transfer to a bowl to cool. Store in an airtight container in the refrigerator for up to 1 week. >Ready to buy a panini press? Check out my Panini Press Buying Guide for the features to look for. >Want more panini recipes? See my Recipe Index for a list of all recipes on Panini Happy. >Traveling to a new city soon? Browse Panini Happy’s Great American Sandwich Guide to find the best sandwiches across the country! This sounds divine! I adore roasted garlic and carmelized onions are a great favorite of mine as well. .-= Arlene´s last blog ..SALISBURY STEAKS WITH RICH BROWN GRAVY AND HORSERADISH SMASHED POTATOES =-. I’ m a caramelized onion lover too! Especially on pizza – yum! .-= maris´s last blog ..Worknight Dinner Recipe: Stuffed Baked Acorn Squash =-. You sure do love your onions, but so do I! Can’t wait to see what other condiments you’ve made! 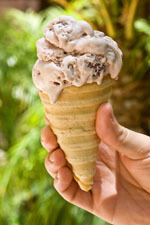 .-= Esi´s last blog ..Cafe Crepe =-. What I wouldn’t give for a spoonful of that yuumyness! OMG, I bet that would be so good on a pizza with some melted cheese. So good! .-= Chuck´s last blog ..Harvest Squash Bread =-. OMG!! I could probably just eat them from the jar!! 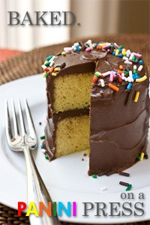 .-= marguerite´s last blog ..Cathy’s Cream Filled Cupcakes =-. Brilliant! 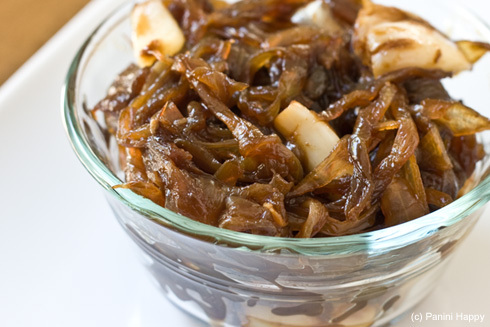 Have you ever frozen caramelized onions? I wonder if that works…This sounds perfect though. I can put caramelized onions on, well, anything. .-= CinnamonQuill´s last blog ..Bread Pudding, without the eggs =-. Looks fantastic Kathy! I am a self confessed ‘condiment queen’ so if I am digging on something it probably is awesome. And I’m digging on that for sure! .-= Emily´s last blog ..Quick and Garlicky Tomato Sauce =-. 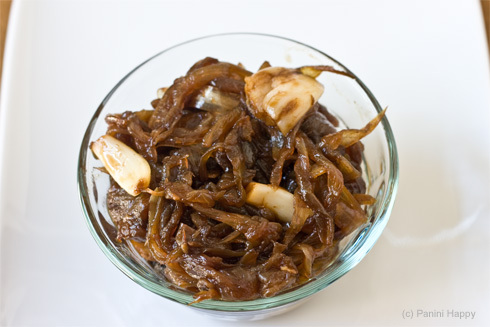 I am so going to have to make a caramelized onion jam now! YUMMM! roasted garlic + onions? Sounds insane delicious. Hi Rachel – it makes about 2 cups total, number of servings is pretty much up to personal taste. It’s amazing how all those onions cook down! Hi Kathy, this is so good, do you ever can this and give it as gifts? Made this last night and it was AMAZING!!! Now I need to figure out how to can it so I can give as gifts. Did you ever figure out how to can the garlic onion jam?